Not a day passes that we are not healthier, richer and better informed because of the treasures we extract from the earth. From minerals and metals extracted from below our feet we create electronic devices like cell phones, televisions and computers to keep us in touch and do our daily business; cars, trucks, trains and bicycles to transport us and our goods; food to sustain us; and medicine and vitamins to keep us well. Virtually every aspect of our modern civilization depends on rocks and minerals from the Earth. The Earth′s history has left a legacy in the geological formations of Nova Scotia of some of these important mineral and rock resources, including salt, gypsum, limestone, coal, gold, and many others - and some yet to be discovered. Long valued by civilization, salt - left behind by an evaporating sea in the early Carboniferous Period - is mined underground at Pugwash, and is pumped to the surface as brine, and then evaporated, at Nappan (both in Cumberland Co.). Most of the salt produced in Nova Scotia is used for de-icing and the remainder is processed into food-grade products, including table salt. Nova Scotia is home to the world′s largest open pit gypsum mine at East Milford (Hants Co.) and also produces gypsum from Little Narrows (Victoria Co.). Many of the homes built in North America contain Nova Scotia gypsum, which is used to manufacture ′gyprock′ drywall. Used in the manufacturing of cement and concrete, but also to reduce acid rain-producing emissions from burning coal for electrical generation, limestone is mined in open pit quarries at Brookfield (Colchester Co.), Upper Musquodoboit (Halifax Co.), Southside Antigonish Harbour (Antigonish Co.) and Glen Morrison (Cape Breton Co.). Once the mainstay of Nova Scotia′s mining economy, coal - "fossil peat" from the Carboniferous ′Coal Age′ - is now mined chiefly from near surface deposits at Stellarton (Pictou Co.) and at Point Aconi (Cape Breton Co.), and used to generate electricity for Nova Scotians. Deposits of gold fed Nova Scotia′s ′Gold Rush′ of the late Nineteenth Century, and are still widespread along the south and eastern shores of Nova Scotia, where they typically occur in quartz veins within folded slates of the Meguma Supergroup. 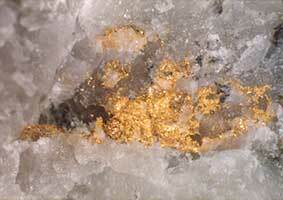 At 99%, Nova Scotia gold is known for its purity. The primary use for gold is the manufacture of jewelery, but the most important industrial uses are in electronics, computers, dentistry, and the medical and aerospace industries.